I have some bananas that's ripening too quickly. Must be due to this crazy hot weather! But it's ok, at least now I can bake! Let me think.. muffins? cookies? cupcakes? Banana cake? Boring... unlike chocolate cake! OMG I love chocolate cake! I wondered if there's such a thing as chocolate banana cake and Goggled it. Apparently there are! I surfed around and found a good looking one from Joyofbaking.com I made some adjustments to the recipe of my own, and this is the end result. Heavenly..! It's the most moist, fudgy, chocolately cake I've ever tasted. 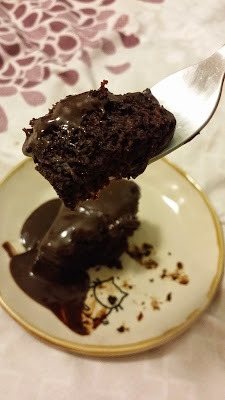 A super rich chocolate cake with a light banana taste. So good, I'm speechless. So... let's bake! Preheat oven to 180C and place rack in the center of the oven. Butter a 23 x 33 cm pan. In a large bowl whisk together the dry ingredients. Set aside. Place the chopped chocolate in a medium sized stainless steel, or heatproof bowl. Set aside. Heat the cream and butter in a medium sized saucepan over medium heat and bring just to a boil. Immediately pour the boiling cream over the chocolate and allow to stand for 5 minutes. Stir until smooth. When Ganache has completely cooled, beat until soft and fluffy. Then spread the frosting on top of the cake. Tell me you don't want to put that into your mouth! Come on..!